The two biggest problems lie in the infrastructure of the banks. THE PROBLEM: Banks feel chained to their legacy infrastructures. According to American Banking, in order to streamline paperless banking, financial institutions have had to build “layers upon layers onto their legacy core.” Doing this only further complicates an old legacy infrastructure. We’re not talking teenaged systems here– we’re talking retired. In 2017, IBM found that 92 of the world’s top 100 banks were still using IBM systems that were launched in the 1960s. Just think for a moment about how much has changed in technology since the 1960s. What’s interesting is that it’s the leading banks that will be the last to modernize their infrastructure, but the fact that they are so distinguished is precisely why they feel unable to leave their dusty mainframes behind: the longer these IT infrastructures go, the more complicated they become. The maintenance and updates needed to keep these complex systems running is very cost-inefficient compared to a cloud or even hybrid-cloud solution. According to Financial News, banks spend about 80% of their IT budgets on legacy system maintenance. The infrastructure is deeply ingrained in the company at this point, and banks would rather just avoid the rip and replace altogether when considering how to streamline paperless banking. Those roots run very deep. It’s no wonder a lot of banks don’t even know where to start as far as implementing new paperless processes. The cloud, however, allows companies to divide and allocate resources between departments, eliminating a department’s needs for multiple cloud applications even if all of the allocated space isn’t always being used. Additionally, banks can divide their cloud storage into pieces which they can turn on and off as the storage is needed. This makes it a much more cost-efficient solution in the long-run. Now, don’t think that you’ve agreed to leveraging cloud that you have to commit to migrating all your data from every data center to the cloud at once. There are a number of ways you can do this to fit your current business needs. When Capital One announced they were to be the first bank in the public cloud, they started their migration process by creating new applications in the cloud and leaving their legacy systems alone. Once they were comfortable with the data backup they had in the cloud, they began the initiative to slowly start migrating data into the cloud. Let me emphasize the “slowly” part. Break your implementation down into bite-sized chunks; start with a small cloud project and slowly work your way towards shutting down your data centers. THE PROBLEM: Departments within banks are siloed with separate budgets. When different departments have separate budgets, they tend to choose which technologies to use without consideration for other departments within your organization. This is natural. But if each department ends up with a different approach as to how to streamline paperless banking, it will be a mess to try to integrate, maintain, support and eventually consolidate. Even if each department doesn’t make the switch to digital banking at the same time, as long as they using the same technologies, it will make the transition to enterprise-wide paperless processing much smoother and a lot more sustainable. Make the push towards paperless banking a company-wide initiative. For those esteemed banks whose legacy infrastructures and separate department processes are part of their DNA, it can be scary to even think about making a change to digital. 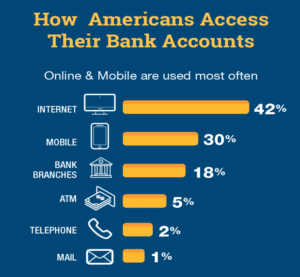 But the numbers speak for themselves– our population is drawing closer and closer to one that demands 24/7 remote access to their accounts, convenient reminders, complete transparency and instant responses. Remember that paperless isn’t just for the customers; banks that find a way to embrace digital will see massive competitive advantages from agility to customer support. Still curious about how to streamline paperless banking? Read the case study on how we helped Frost Bank accelerate their journey to a paperless trust department. About the Author: When I’m not writing and editing content here at Pyramid, you can find me walking dogs at a shelter, practicing yoga or spending time with my friends.